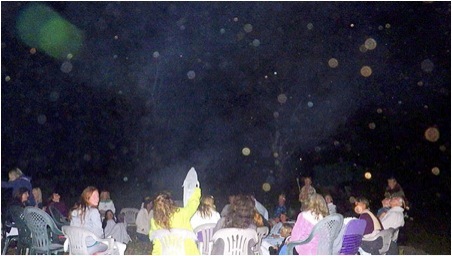 At Sky Island Ranch, we are participating in experiments called Time Travel or Quantum Accessing to parallel worlds. 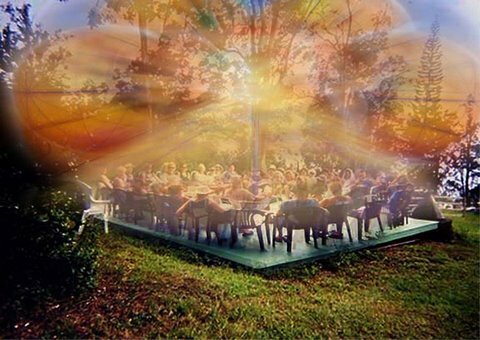 These are a process of group active meditations where we enter the Alpha vibration state, in which we are relaxed but awake and aware. We prepare a clear Intention for what we want to learn/ achieve and then approach the entrance (or Portal) to the vast possibilities of infinite dimensions. On the count of three we all Jump together to another parallel world where each of us exists simultaneously with our present, current life on planet Earth (called our Earth life.) Upon Jumping, our vibrational frequencies successfully elevate to another dimensional frequency where the parallel worlds exist outside of the time and space limitations we experience in the Earth life. The process of doing this together seems to enhance the ability to shift our frequencies as a group and enter holographic sound and light worlds beyond our Earth life. Once we are there, we can move around in that setting, we can communicate with the people who are there, we can observe the circumstances and we can also merge with their energies to instantaneously gain the knowledge they have. Often we see ourselves actually blending into the quasi-physical form of our duplicate self who resides there. Our two bodies merge into one and then separate again. In that moment we have received the positive wisdom and abilities and life enriching qualities of the other. 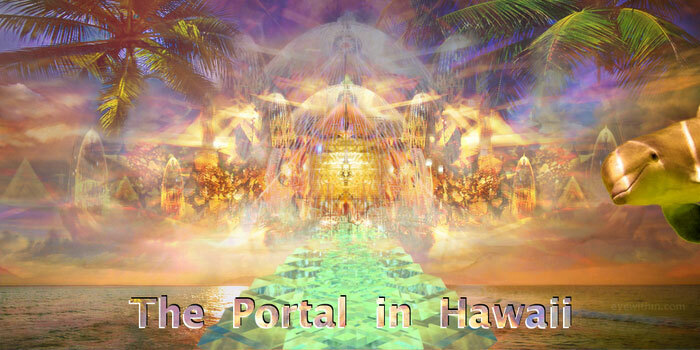 We then return as a group to this Earth life again, by accessing the portal and entering it with the mutual intention to return to this present timeline. In the first introductory experiments with this time travel process, we entered worlds where the civilization was similar to our own on Earth. In that way, we could immediately recognize and relate to the life style there. As in an experience of déjà vu, there are relationships between what we are perceiving multi-dimensionally and what we already know in our present Earth life. This was a good way to begin our travels and to feel comfortable with the process. We also would venture into the past to visit a timeline where our twin self was living in our own past. We could then review some of the incidents of our past that were buried in our unconscious and were causing challenges in our current Earth life. By bringing these memories/experiences into our awareness, we are able to release them. We learned that just visiting these other parallel timelines of our own past, could miraculously eradicate the problems. The way we do that is to visit the time when the problem first began, merely observing our duplicate self experiencing the trauma and not interacting with the people at all. We then return thru the portal and set a new intention to visit a timeline where our duplicate when faced with that same situation, reacts differently and has a different way of handling it that is positive and empowering for all. Observing this as witnesses, we then merge with this positive duplicate self and then return to Earth time again. 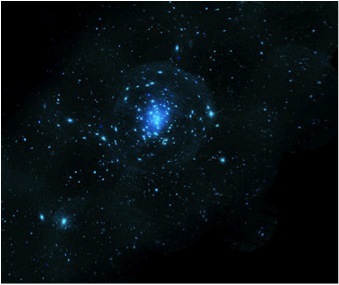 We have learned that in 75% of the cases, the original problem has now dissipated and is no longer creating difficulty in this current Earth life. We are cured, healed, recovered, at peace, in love and no longer troubled. It seems that the only time it does not work is if the Jumper has a reason to want to hold on to this debilitating memory for reasons of his or her own. After 2 years of group meetings, as our schedules allowed, and jumping together, we were ready to move on to the larger purpose of these Quantum Accessing experiences. And this is to change a possible, predicted/prophesized, negative future for Earth into a healthy one, by visiting a positive, parallel timeline of Earth and merging with it. We have become Time Travelers entering the future to advise and meet our future relatives. When doing this, we serve as wise elders to the future generations. We come from the past to explain the dangers of careless life styles that are detrimental to the Earth and humanity and the solar system. We set our intentions to visit future events that are positive and thereby health promoting for our current planet. After setting our intentions (for Example, we often go to see the day when the advanced and loving civilizations from another timeline come to our Earth to assist us.) we then make the jump together and find ourselves there in the middle of that future event as it is taking place. We are witnesses to the future timeline technologies that can remove all pollution from the oceans, bring salt-free water onto the land for irrigation, clear the air of all the negative effects of Chemtrails, provide advanced seedlings that are energized and safe to plant and eat, putting an end to starvation, we see the free energy in place, helping people worldwide, so there is no more poverty or scarcity. We experience the results of these humanitarian changes where people are cooperating with each other from every culture and country, recognizing the innate kinship. But what we have also learned is -- that by visiting these timelines we are also creating that reality just by going there. We have learned the power of our thoughts and our visual imagery. What we think we create. We only needed some guidance and group mind to focus together and thereby create the world we choose to be our future. It is unfolding as we jump there to see it. Do you see how that works? It does work and the knowledge that what we are doing is actually creating a positive and loving world brings us so much inner peace. We become the higher expressions of our Multidimensional Selves. We are multidimensional just like the dolphins are. They have been reminding us of that for decades. We do not need to limit ourselves to 3-D reality. As this healing increases, our planet Earth is set loose from her place in the lower frequencies and she can release her lower frequency realities. As she releases the old, she can expand into the higher dimensions of her planetary self. With this process, we as Time Travelers are able to maintain our earthly lifeline while moving temporarily into a new Earth reality, interacting with it in a positive way and then returning to our 3-D world again to assist here. Because we accept and understand that we are multidimensional beings, temporarily on the Earth planet here, we can freely bi-locate to a New Earth. We do this by keeping our physical body anchored in constant contact with our own planet Earth while using our Lightbody to cross the dimensions into a Fifth dimensional world. As we traverse this portal repeatedly, we also serve to keep this tunnel open and maintained by our future generations. Remember that time is an illusion of the third dimension. From our view of simultaneity of all worlds, we are able to see that all the generations are present in the Now and are all One. The awareness and contributions of generations that come after us, actually influence our own generation which appeared to be in their past. Generations and timelines before and after us, are all influencing each other. 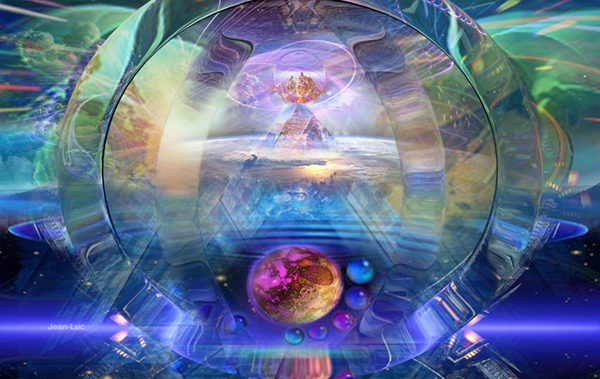 When we enter fifth and higher dimensional worlds, there is no longer any such thing as Time. And we can look into different timelines as easily as we can change a station on the radio. It is good to be comfortable with releasing the beliefs and limitations of time. As an example: when I am gone for an hour from Earth time, I have actually spent the equivalent of 3 months on the Andromeda spacecraft. Time is relative! As we experience these changes remember to stay grounded in your physical body, connecting with the Earth. Doing the mundane things in life can be helpful right now to keep us balanced as we traverse our soul’s new pathways.